….”We never got a chance to thank you in person for how wonderfully you performed at our wedding at the “Landmark” Hotel. We had so many compliments about the ceremony and how your music was so befitting and elevated everyone! We are so honoured that you played for us! Your choice of music was perfect, the timing was excellent and you looked fantastic ! The harp is the most beautiful and elegant of instruments and is the perfect choice for weddings, corporate events, birthday parties and other special occasions. Your guests will be enchanted with its romantic sound, even though it remains soft and unobtrusive. It is a most versatile instrument and can lend itself to classical and folk music, show tunes, popular chart hits and jazz. 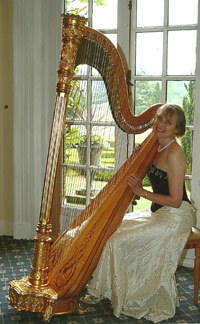 Geraldine has many years of experience as a wedding harpist, both in the United Kingdom and abroad. Whether a Church, registry office, hotel, stately home, castle or private house, all religious denominations, secular ceremonies and musical interests are catered for. She is happy to discuss choice and possibilities of music. 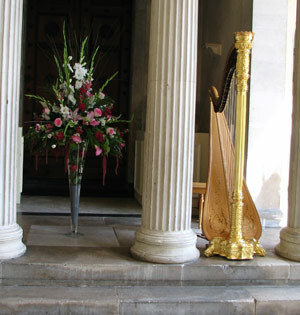 As the harp is portable it can be used in venues or churches where there is no piano or organ. Geraldine has an extensive wardrobe of stunning evening and cocktail dresses so that her outfit will blend with or complement the choice of Bridesmaids outfits. All Brides take time and trouble planning their wedding day down to the last detail and for Geraldine this is just as important as the choice of music ! Her beautiful gold and maple harp will be a perfect addition to the day both visually and aurally. Geraldine will commence to play as guests arrive at the church or civil venue. The Bride will enter to music of her choice for the Processional, then comes music during the Signing of the Register and finally, the Bride and Groom exit with the Recessional. Additional pieces can be played, for example, in between readings or, for a Church Service, during the Communion. These are merely suggestions. There are many other options and Geraldine is very happy to discuss selection of music with you. Please be aware that no religious music is permitted at a civil ceremony. 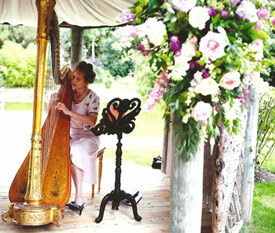 Geraldine will set up her harp ready to provide music, half an hour before the Bridal Party is due to arrive and will begin to play as the first guests arrive .She will continue to play as guests have their Reception drinks and whilst photographs of the Bridal party are being taken. Music will be provided for the Wedding Breakfast as the guests enter the room to take their places, throughout the meal and up to the point where the cake is cut or the speeches start. Music is an instrumental selection of light classical, popular songs, melodies from the hit West End Shows, arrangements of folk tunes and light jazz standards. A sample list of music can be viewed in REPERTOIRE. Any particular songs or melodies which the Bride and Groom wish to be included on the day, and which are not in the repertoire list, can, in most cases, be played, provided ample notification is given. "....She adds to her musical deportment, a personal charm and presence that creates an ambience, which if it doesn’t captivate will certainly mesmerise"
"...Thank you very much for your special assistance during our recent Seattle and Tacoma Travel Fairs. Your beautiful music and voice were the highlight of the evenings...."
Geraldine has performed at a variety of venues. Click here for a full list.